First of all I looked at my chair. 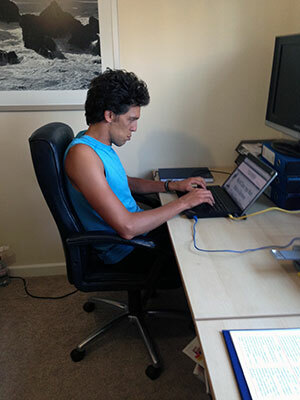 I realised very quickly that my six foot seven frame was not designed for a regular office chair! On its highest setting my knees were still above my hips and the lumbar support was pushing into my lower sacrum…think of an adult sitting in a kids school chair! I found a box and a cushion to raise my hips up until they reached the 120degree angle to my knees whilst maintaining my feet flat on the floor. As my office chair was designed to recline, I unscrewed the seat from the base and rotated it through 180degrees before fixing it back on again. This had the effect of allowing the chair to tilt forwards rather than backwards. As I was now sitting on a box I needed to create a new lumbar support. I used a zafu meditation cushion which works perfectly fore providing support exactly where needed. Like my chair, the desk was not made for someone of my size and I was struggling to get my knees underneath now that I had propped myself up on the chair. I used some old accountancy books under the table legs and hey presto, a desk at the perfect height for me! The solution to points 5 and 6 came with a stroke of luck. We no longer use our telly so I had a spare screen I could use in conjunction with my laptop. 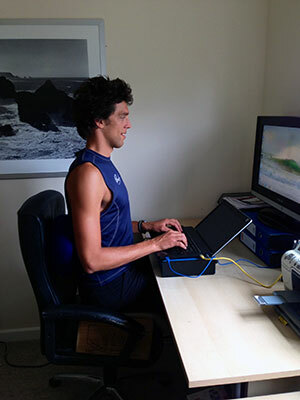 To try and get arm posture and head posture correct with a standalone laptop is next to impossible so the screen and the keyboard/mouse need to be split somehow. (If you don’t have a spare screen you can always buy a cheap plugin keyboard and mouse for your laptop allowing the laptop to just be used for the screen and therefore propped up a lot higher. In my setup I propped the laptop up on a box file so that I could type comfortably with my elbows directly below my shoulders and slightly lower than the wrists. I then wired up my spare screen and propped it up on three box files so the top of the screen was at eye level then pushed it back so it was at arms distance away from my eyes. As you can see my posture has improved dramatically and I can feel my back responding already. I hope this article has provided some useful information for you in your quest for a strong, healthy back.